Portrait of Miguel de Cervantes Saavedra by Juan de Jáuregui. Please proceed with caution when combining versions of Don Quixote. Please note that there are separate works for unabridged/ abridged/ various adaptations/ Volume 1/ Volume 2/ other numbered volumes/ etc. Our Big Summer Classic concludes! We'll finish our discussion of Don Quixote (chapters XXXIII-LXXIV, pages 677-940) and raise a glass to celebrate our accomplishment! All are welcome! Our Big Summer Classic continues! We'll be discussing chapters XLII-XXXII, pages 374-677 from Don Quixote. TONIGHT is World Book Night! For more information about World Book Night, check out their website. We are proud to be working with this wonderful organization to spread the love of reading. World Book Night occurs on April 23rd because this day is significant for a couple of literary-related reasons! April 23rd is William Shakespeare's birthday AND the day that he died. 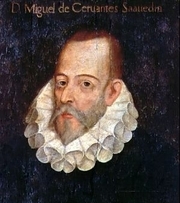 Miguel de Cervantes also died on the exact same day as Shakespeare; he is known for his novel, Don Quixote. Lastly, April 23rd is UNESCO's International Day of the Book! Whether or not you are participating in World Book Night with us, join us in reading a little tonight in celebration. As always, please feel free to contact us for any recommendations! Miguel de Cervantes, El Quijote. ; Ramon Llull, Llibre de meravelles. Miguel de Cervantes is currently considered a "single author." If one or more works are by a distinct, homonymous authors, go ahead and split the author. Miguel de Cervantes is composed of 84 names. You can examine and separate out names.